The seasons become blurry to Utah coach Larry Krystkowiak, who was convinced as he spoke during a news conference this week that his basketball team played USC only once last year. In reality, the Utes lost twice to USC, by 17 and 16 points. Utah’s latest meeting with the Trojans will be much more memorable for Krystkowiak. Utah responded to that slice of history Wednesday night by taking a 20-point lead late in the first half on the way to a 77-70 win at the Galen Center in Los Angeles. 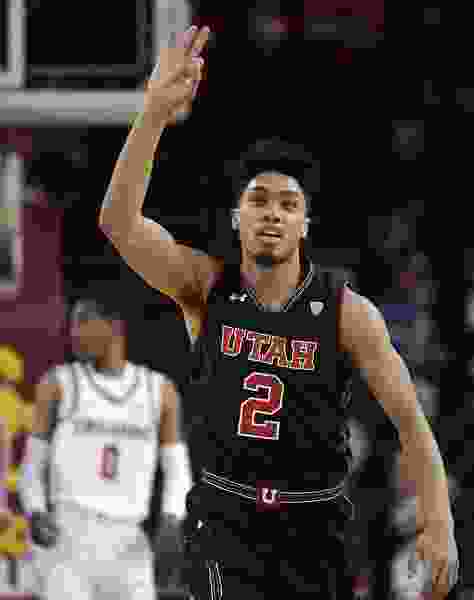 The Utes went ahead by 23 points midway through the second half, then held on after the Trojans got within seven points in the last three minutes. Parker Van Dyke’s 3-pointer secured the victory. Ute center Jayce Johnson, a Southern California product, delivered his best game of the season with 13 points and 13 rebounds. Utah got big contributions from seven players — even though Timmy Allen, the team’s best player in last week’s home losses to Oregon and Oregon State, played much less than usual because of foul trouble. After a lengthy stint on the bench in the second half, Allen returned to the court after a timeout and drove for a 3-point play that temporarily halted a USC run. Both Gach scored 15 points and Sedrick Barefield added 13 for Utah. Donnie Tillman had 12 and Riley Battin and Van Dyke scored nine each. Utah is 12-10 overall, 6-4 in the Pac-12. USC is 13-10, 6-4. The Utes had fallen from second place to a three-way tie for fifth in the conference after last week’s two defeats. Now, Utah is tied with USC for fourth. Krystkowiak made his first change to the starting lineup in Pac-12 play, using Gach in place of Van Dyke. Gach made the strategy appear shrewd in the first half, scoring 11 points. His consecutive 3-pointers gave the Utes a 37-17 lead, before the Trojans scored the last six points of the half. Earlier, the Utes had used a 19-5 run to go ahead 26-12. That margin was somewhat frightening, considering Utah lost a 14-point lead in the first half last week against Oregon, but this time the Utes ended up with a 14-point halftime edge. USC forward Nick Rakocevic, one of the league’s top performers in Pac-12 play, posted only two points and one rebound in the first half, when he was called for two (flagrant) rebound fouls and played 12 minutes. As the second half started, the Trojans fell behind by 19 points and the Utes had two possessions with chances to add to that lead. But they missed 3-point attempts on both trips and USC began its comeback. The Trojans got within 14 points, before Utah’s 8-0 run rebuilt the lead to 50-28. USC’s next rally cut the deficit to 17 points, but the Utes quickly righted themselves again. Barefield’s 3-pointer made it 56-33 with 11:29 to play. USC didn’t quit, though. The Trojans used an 11-2 run to get within 14 points. USC faded, then asserted itself again, before the Utes steadied themselves. The teams were opening the second half of the Pac-12 schedule, with the Utes having gone 3-1 on the road and 2-3 at home in their first nine conference games. Utah has home-and-home series with USC and UCLA in the second half of the league season. The Utes will remain in Los Angeles through Saturday afternoon, when they visit UCLA. The Bruins fell to 5-5 in Pac-12 play with Wednesday’s 84-73 loss to Colorado at Pauley Pavilion.